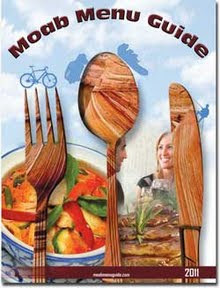 Food Adventures of a Comfort Cook: Moab Diner is Still a Must Do in Moab. Moab Diner is Still a Must Do in Moab. With Moab constantly expanding with new hotels, motels, shops and restaurants; it is a pleasure to be able to enjoy a meal at a long time establishment like the Moab Diner. While the exterior and interior may have gotten a facelift, and a few minor changes to the menu, it is still the same for really good diner style food and fast, friendly service. After having a horrible morning having our taxes done; we felt we needed, no, deserved, a feel good treat. What better place than the Moab Diner? Our server was Tasha and we adored her; warm, friendly, and truly made us feel welcomed; exactly what we needed! The lunch special was Hot, Open Faced, Turkey Sandwich which I ordered; medium thick turkey slices which has been put on the grill and had a slight smoky flavor; over two slices of toast with mashed potatoes, green beans, cranberry sauce and gravy. Hubby went for the Mushroom Swiss burger with all the fixings; new item in the French fries department is skin-on which, in our opinion, makes the fries taste so much better. We also treated ourselves to the onion rings appetizer; crispy batter surrounding intact onion slices; not that chopped up stuff you get in the frozen food section; also came with ranch dressing for dipping. Wait, not done yet! Oh no, we were in full tax preparation depression, so ordered one of the most decadent desserts the Moab Diner offers, Cinnamon Roll Rage. A large, warm, cinnamon roll covered with caramelized pecans and caramel sauce; with a large scoop of vanilla ice cream. No, we did not eat any dinner that night! Whether you want to start the day with a great breakfast; treat yourself to a good lunch or dinner after seeing the sites, hiking, climbing, biking, or river rafting; why drive all around Moab looking for a place to eat...go to the Moab Diner.